When you sit down with your RTE Guide this Christmas, it won’t take long before you spot It’s a Wonderful Life in the TV schedule. Frank Capra’s 1946 masterpiece is as much a part of festive season as tinsel and turkey. But if it hadn’t been for a fortunate quirk of fate, we might be living in an alternate reality where one of the most popular films of all time had never been loved at all. Perhaps it is not surprising that It’s a Wonderful Life was not particularly popular at first. After all, for most of its running time, it is quite a serious story about how the hard-working George Bailey (James Stewart) becomes so filled with despair at his constantly thwarted ambitions that he is driven to contemplate suicide. Only the intervention of his bumbling guardian angel Clarence shifts it towards a more comic, feel-good ending. But there’s a lot of darkness before the light so it wasn’t something audiences wanted to see in the wake of the second world war. It certainly didn’t sound like the basis for a future Christmas classic. Then again, Capra never intended to make a Christmas classic. "I didn't even think of it as a Christmas story," he admitted years later. "I just liked the idea." It’s a Wonderful Life was the first film that Capra and Stewart made upon their return to Hollywood after the war, an experience which had profoundly affected both men. Capra had worked as a propaganda documentarian for the US War Department and had seen much evidence of the horrors of war. Stewart had flown several missions as a fighter pilot in Europe, returning to acting disillusioned and suffering badly from post-traumatic stress disorder. With few other offers forthcoming, he took the role of George Bailey and his fragile mental state would lend his performance real authenticity as he, like George, struggled with his inner demons. Meanwhile, behind the camera, Capra fell out with his writers and composer, the shoot fell behind schedule and the budget rose alarmingly. It was not a wonderful film production. 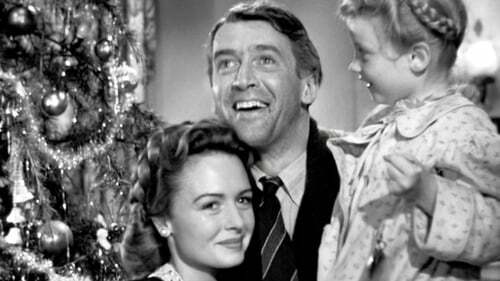 Things didn’t get any better when It’s a Wonderful Life was eventually released. Mixed reviews and an unenthusiastic public reception resulted in disappointing box-office returns. Further damage was done by an FBI investigation which concluded the film contained subversive Communist propaganda, particularly in what they considered the demonization of bankers. Moreover, Mr Potter (Lionel Barrymore), the villainous banker in question, actually avoids punishment in the film, leaving it in breach of Hollywood’s Hays Code, which demanded onscreen baddies receive their comeuppance. All these elements contributed to the financial failure of the film, leaving Capra deep in debt and with a badly damaged professional reputation. It seemed as if It’s a Wonderful Life would have to settle for an unremarkable existence while other films went on to greater things. But then a curious thing happened. In 1974, an administrative error meant that the film’s copyright was not properly renewed, meaning TV stations could effectively screen it for free. Over the next two decades, it ended up being broadcast repeatedly into American homes, especially at Christmas time, cementing a place in the public consciousness as a film which promoted good old-fashioned values in an increasingly capitalist society. This quite literal free-for-all was only ended in 1993 when Republic Pictures slyly mounted a successful legal case to show that they owned the rights to the movie because they owned the rights to the short story on which the film was based, Phillip Van Doren Stern’s "The Greatest Gift". By that stage, however, It’s a Wonderful Life had firmly established itself as a Christmas classic. The happy ending, in which George sees how things would have been if he had never existed and realises the true value of his life, proved to have universal appeal. In fact, ‘The George Bailey Effect’ is now a recognised psychological phenomenon, based on a study carried out in 2008 which demonstrated that mentally subtracting a good thing from their lives can make people feel better. Variations of this "what if" exercises have reported similar results and this strategy has been used to promote positive mental health. That said, the darker elements of the story also speak to many viewers at this time of year. Disrupted travel plans, stretched finances, work commitments and family responsibilities are all issues that actually mean it’s a stressful life during the holiday period. Although the film may ultimately celebrate the kindness of people, it doesn’t shy away from those issues and is not so naïve to suggest money does not matter. In fact, with our recent experience of bailouts and foreclosures, it remains a remarkably relevant commentary about the thorny economics of banking systems. Indeed, Capra received much hate-mail for letting Mr Potter off so lightly, but his judgement proved quite astute, as many true-life, modern-day Mr Potters could testify in the wake of the global recession. Thus, the film may be a heart-warming fantasy, but it is one firmly rooted in the cold realities of life. Thankfully we do live in a world where the true value of It’s a Wonderful Life has been recognised. Don’t you see what a mistake it would be not to watch it this Christmas? It won’t make your everyday troubles go away, but it’ll remind you to cherish your life, your family and friends. And remember, no man is a failure who has friends.